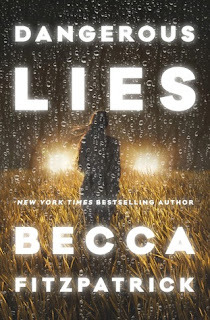 Dangerous Lies is told from the first person point of view of Stella, and Stella does a great job as narrator. I wasn't sure if I would like Stella when I first began reading Dangerous Lies, as she is a bit rough around the edges (which she's more than entitled to given her upbringing), but as I continued to read on I found I quite liked Stella, I admired her ability to start over with no friends or family. Readers will adore Chet, as he wears his heart on his sleeve where Stella is concerned. I really liked the way the romance grew between these two, it wasn't instant love, but there's a definite spark of attraction. I think my favourite part of this book, was the pseudo-mother/daughter relationship that formed between Stella and her guardian- the way Fitzpatrick wrote the verbal jibes between these two was so believable and enjoyable. I would recommend this read to fans of YA whom enjoy a bit of romance and suspense in their contemporary reads.